The past comes back to haunt you in the bonus game! Relive your journey through screensavers, music, art, and more! 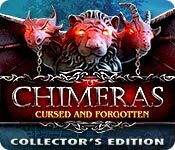 Chimeras: Cursed and Forgotten Collector's Edition is rated 3.8 out of 5 by 36. Rated 5 out of 5 by bmn5772 from MY KIND OF GAME The Elephant games are the best. Non-offensive, and just plain old great-to-play games. Keep em coming! Rated 5 out of 5 by gyanda from So lovely!!! This is one of the best games i played in years! Everything is so smooth-playing, it is a shere pleasure. When games like this enter my life, i really feel blessed, because it is so rarely that a game is such entertaining AND smoothly built. I love when developers put so much effort in their games that they play like a wonderful dance. Thank you developers!!! It is such a joy to play this game!!! Rated 5 out of 5 by scamp69 from Best Game this year! Especially for beginners or old folks. I thoroughly enjoyed this game. It was somewhat easy because I did not have to use Hint or SG. Two puzzles were hard and took quite a while to finish. I missed 6 puzzle pieces. The morphing objects start out as thistles but later on they can be anything. Do try it, although I'm sure the expert fishies will find it too easy - although I play Casual. Rated 5 out of 5 by skullfun from Elephant's Chimeras 3 has a new twist in Scotland.... In this latest edition of Chimeras, Travel back in time to Scotland and unlock the tragedy of the Heartfell family. You meet Elizabeth and William; her Groom to be early in the adventure. Your ancestor Elizabeth is then kidnapped by a notorious bandit nicknamed "Storm." Your journey leads you back in time where you must learn who is friend or foe in order to rescue Elizabeth. Marrying Elizabeth gains control over the country. You soon learn that The Count of Heartfell (Elizabeth's father) has arranged a difficult task so his successor must prove his LOVE and WILLINGNESS to rule the country when he dies. The story takes a shocking twist when you learn of a Chimera Spell which allows a magical exchange of bodies. Reminds me a bit of the movie "Groundhog Day". It’s all about a curse that has the village reliving the same day over and over again. You somehow manage to travel back in time and become trapped in the same curse, which means that you must find a way to break it somehow. As a matter of fact, the adventure is quite engaging, but the lack of a challenge can be a bit of a bother. Thankfully, at least there’s plenty to admire while you are aimlessly solving riddles, since the game looks gorgeous in every regard. Starting with the hand-drawn landscapes, all the way to the cut scenes and the short animations, everything looks impeccable. In the end, Chimeras: Cursed and Forgotten is a tad too easy to keep you busy for long, but at least it’s pretty and engaging when it wants to be. Hence, you can definitely fill a few afternoons with it. The CE extras are the usual and the Bonus Game is fun but doesn't add anything to the main story. I enjoyed this but it wasn't as good as previous Chimeras Series. Rated 5 out of 5 by Marja67 from Wonderful! Great game. Beautiful graphics, good music, good story. Rated 5 out of 5 by bwake47 from ANOTHER GREAT GAME IN THE CHIMERAS SERIES!! I have to say, Chimeras: Tune of Revenge was one of my all-time favorite games. I loved everything about it from the poem at the beginning of the game, to the very last game play. I know there is never a sequel that is as great as the first in the series. That being said, I did really enjoy this game also. Maybe not as much, but it is definitely a good game. I enjoyed the Irish accent everyone had, the Irish music as a whole, but I do have to say I got very tired of the same music in each HOS. By the end of the game I could barely stand listening to it again. During the bonus game I actually turned it off. Not for long however, because I didn't want to miss any of the other music. :) I don't have much patience for puzzles that require time to solve, but I did enjoy the HOS. They were varied and I like that. All in all, I do rate the game 5*. It was beautifully done. I enjoyed the HOS music for the first half of the game. Many have enjoyed it all the way through. Give the game a try. I think it is definitely one of the best we've had in a long time and I look forward to the next game in the Chimeras series. I bought this game without doing a demo, and I'm not the least bit sorry I did. Happy Gaming !! Rated 5 out of 5 by SlipperFish from Fun twists and turns in this Scottish Time-Travel adventure Sigh. I just finished this fantastic game and I was charmed from beginning to end. The story was wonderfully twisty and the characters very engaging. It's quite a long game and the bonus chapter is lengthier than the norm and wraps up the story in a very satisfying way. The minigames were fun and logical and the HOS were just right (not too few, not too many; not too hard, but not too easy-- you get the picture). The morphing items were a bit too easy to spot-- but the ones that are crazy hard to find can be very frustrating, so I was happy. And, THANK YOU developers for allowing me to reuse some of the items I picked up along the way. We actually get to keep a sharp object for frequent use! Makes me feel like a fairly intelligent adventurer instead of an idiot who drops the knife after one use (because it's so heavy? cut a hole in my pocket?) only to carry a ladder, an open pot of glue, and a heavy rock around for three scenes... just in case... Also, you rewarded us with multiple finds in many locations. Very satisfying. I congratulate the developers for working so hard to make the tasks more varied, rewarding, and original in this game. My only beef is that the hidden puzzle pieces I collected throughout the game didn't get used in the Extras area. Or at least I couldn't find a puzzle area there. All in all, one of the best games I've played. I'm very glad I opted for the CE version. Rated 5 out of 5 by shripch from Lovely, lovely! Finally a game that's as beautiful to look at as it is to play! It's been a long dry spell of dark gloomy games and I haven't been interested in playing any of them. This game has it all! Story, beautiful graphics, morphing objects, hops, puzzle pieces to find, and on and on. An instant buy! Thank you for a great game. Rated 5 out of 5 by biscuitsmama from A SEARCH FOR THE PAST BECOMES REALITY On a vacation to Scotland to search out your ancestral home and roots you definitely find more about your family than you ever thought possible as you are hurled almost 250 years back in time to save the Heartfell’s when enter into a past where one day in time repeats over and over again waiting for someone to break the Chimera Spell. You must save Elizabeth from her fate and become “the one that will save us all” in this wonderful fantasy tale. A word of warning – this game starts out a bit slow with all sorts of idiotic tasks that you must fulfill before you get to the heart of the story. When I first played the beta for the game I gave up within ten minutes of starting the game because I was so disappointed with what appeared to be a nonsensical, idiotic game that in no way deserved the Chimeras title. Well, after putting some distance between my first feelings about the game I decided to give it another go, which is when I began to see a different story emerging. Yes, I still needed to wade through what I considered some irritating and mundane tasks before I began to see the real gem beneath the surface and I am happy I kept moving forward. I urge you to look beyond the beginning scenes and play with an open mind since Lost and Forgotten develops into an excellent game. Although the graphics are nothing like those in the original Chimeras game they are still excellent. I love the most of the background music that at some times is a lively jig. However the music that borrows from another game from this developer, Unfinished Tales – Illicit Love, seems a bit out of place in this game. For the most part the voiceovers are good except I didn’t care for William’s attempt at a Scottish brogue. The custom mode is included and the hints and skips recharge in a range of 15 to 90 seconds. You have an interactive map that is present at the beginning of the game. The HOPS are very typical with minimal interaction and mostly the standard list type (my favorite). 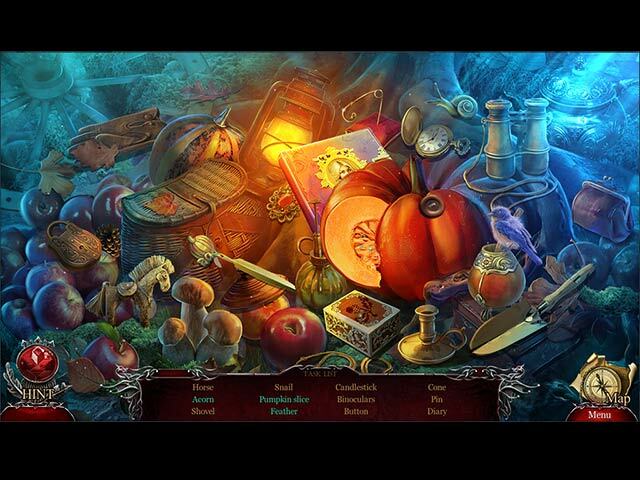 The HOPS are good with most items easy to find but I did need to use the dreaded hint button to find two objects in the first HOP since those items were hidden in dark shadows and were very difficult to see. The mini-games were on the easy side but still entertaining. There were none that gave me brain strain but they were fun and that is what counts. I am sure there will be one or two minis later in the game that I might skip because that generally happens, at least the first time I play through a game. 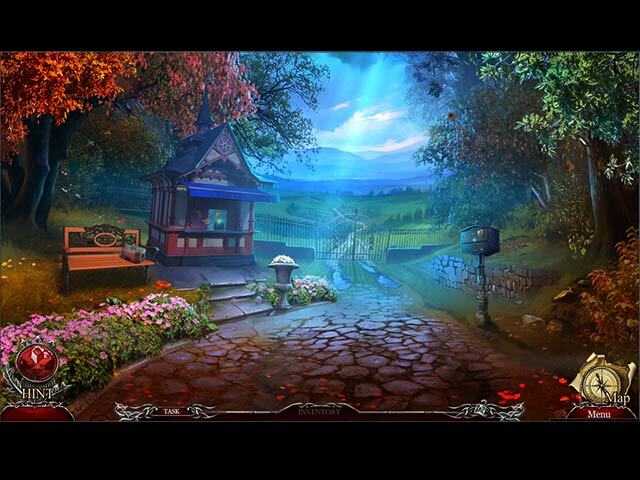 The CE version of the game has lots of extra goodies including a Secret Room. 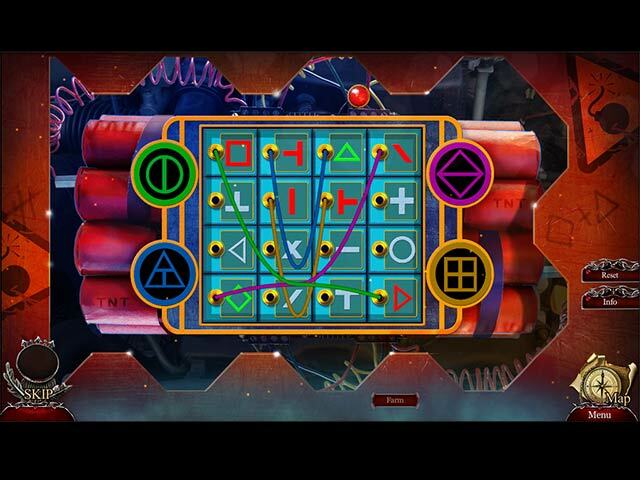 Throughout the game you will find puzzle pieces that create three different puzzles. There are also Tarot cards to be found as well as morphing objects. If you love achievements you can earn those as you play through the game. The other extras are the standard fare including the bonus chapter and strategy guide. Although I almost passed on this Chimeras game I am so glad I gave it a second look. By the time I got to the end of the demo I knew this would be an excellent game, and it is. I know the Lost and Forgotten doesn’t seem to fit in with the other games in the Chimeras series and that is what initially put me off. If you can make it through the silly tasks in the beginning you will most likely agree that this is a terrific game. Even though I love this game, please try the demo to see if it is a game you will enjoy.